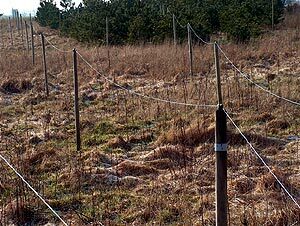 Two years after our first visit to the famous beverage farm of Wilhelm Herbst in Northern Jutland, we, Cornel van Ravenswaaij, Max van Arnhem and Guido Schotmans, decided to return because conditions are moving slowly to a solar minimum now. Just a few days after we confirmed our stay, a major solar storm took place that will go into history as one of the most intensive ever seen. During the weeks and months that followed, the sun was never quiet, resulting in awful conditions on the medium wave band. Nevertheless, we were in luck: a week or two before we moved north the sun became quieter. Similar to our first DXpedition we left very early in the morning hours and arrived around 13.45 hours in Fjerritslev in Northern Denmark. The journey from Belgium and The Netherlands to the Northern part of Denmark was easy because the weather was fine. This made it possible to use the twilight DX-conditions immediately. After all, it's "plug-and-play" at Wilhelm's beverage farm. 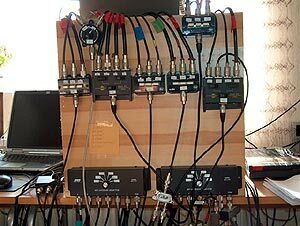 Just unpack your receiver and recording equipment, hook it up to one of the 21 beverage antennas and enjoy the DX! 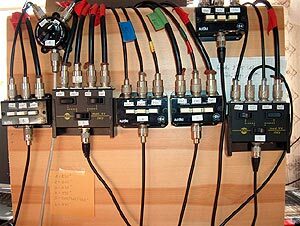 For those unfamiliar with the beverage farm, we can say it is very enjoyable to have a warm place and a switchblock connected to 21 beverage antennas. The beverage antennas are pointing to all directions and vary between 80 and 300 meters. Also, very important, are the separate sleeping rooms for every participant. This means that every one of us could listen or sleep, day or night, without disturbing the others. And sleep is important during a one-week listening period. Our listening equipment consisted of the following receivers AOR AR-7030, AR-7030 plus and a JRC NDR-545. Our main interests were mediumwave and the tropical bands. Cornel also is an avid Non-Directional-Beacon chaser, so he enjoyed the lower frequencies. On mediumwave we experienced somewhat better conditions than in 2003. In the afternoons we heard quite a lot of Iranian stations. Radio Sighet 1404 from Romania was extremely strong. In 2003 we found Radio Asia from the UAE on 1575 kHz, now we discovered this station on 1557 khz. New Radio Farda from the UAE on 1575 kHz was strong. We were a bit astonished that we did only hear once WYFR Family Radio Taiwan on 1557 kHz. In 2003 this station was heard almost daily. Radio Juventus Don Bosco 1640 kHz from the Dominican Republic was heard the first morning of the week. The reception of X-band stations was a bit disappointing. Best reception of North Americans was on the morning of the 7th of February. Stations from the east coast were heard until 09.45 hours UTC! On the tropical bands we heard familiar and new stations. Marfil Estéreo 5910,48 from Colombia was booming in on the morning of the 6th of February, a real pleasure to listen to some llanera music and many identifications. Of course we tried to listen to Indonesia and we were successful to hear the RRI stations Pontianak, Kendari, Palu and Jambi. We didnt hear other Indonesians. 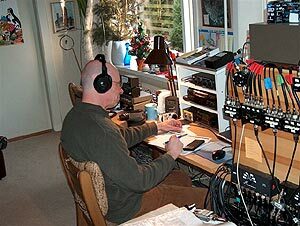 Radio Apintie 4990 from Suriname was an almost daily guest in morning. 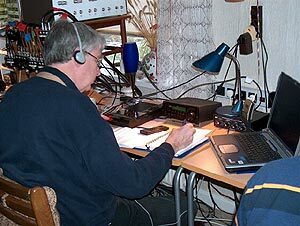 Also we did some early night listening sessions and heard several nice signals from Peru and Bolivia. We all brought our laptops and used them during all listening periods. Important to mention is that we hardly experienced any interference from this equipment. We were very satisfied with the computer program RxWings developed by Dutchman Jan Arkesteijn. This program works excellent together with AOR and several NRD receivers. It has many features that are useful while DXing intensively. When you read this, Jan has just issued an update of this excellent piece of software. For more information and free of charge download go to Jan's homepage. We used both cassette and minidisc recorders as we did two years ago, but now we used the fine virtual recorder RecAllPro most of the time. Earlier, Guido wrote an article about this way of recording. His thoughts can be found in an article on DXing.info. Overall, it was once again an interesting experience that resulted in a lot of recorded material. So, we have still some work to do, sorting out our recordings and writing reception reports. Back home we continued chasing the MW and we were surprised by some continuing good conditions. That makes the pile of reports to write even higher, but of course, thats the way we want things to be! 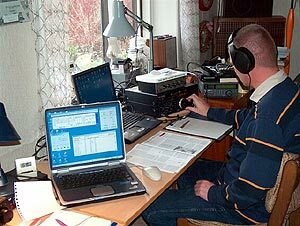 Our logs are divided into the mediumwave log, tropical band log, shortwave log and NDB log, all files in Excel format.